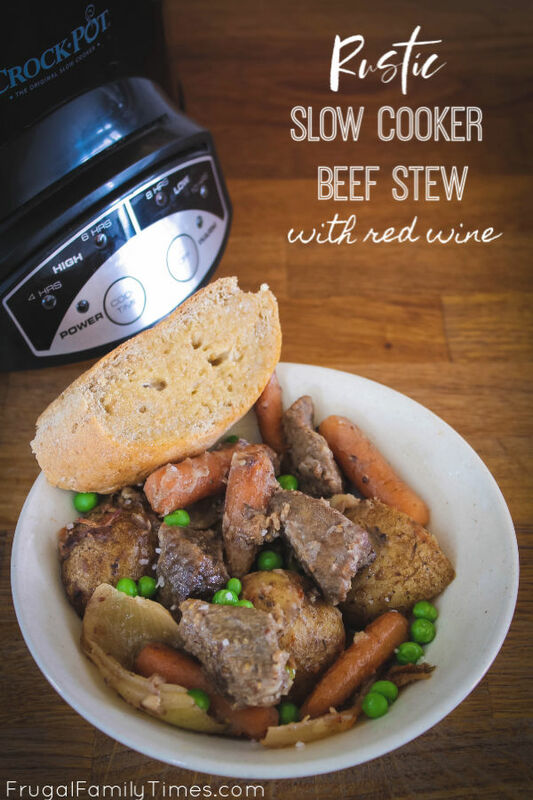 I decided to call this slow cooker beef stew with red wine recipe "Rustic" but I could have easily called it "Kid-Friendly". This beef stew has big hearty chunks of meat and vegetables - so rustic, right? Those same big pieces are what makes it great for kids too. Big chunks mean it's great for reluctant eaters (aka "picky eaters" - but I hate that term - so judgy). Kids can pick out the ingredients that they're most comfortable with and then the whole table is happier. Another perk of this recipe - it's so low prep. There's the added step of browning the beef and making the gravy from the browned flour left in the pan - but it's incredibly worth it! The gravy is rich and hearty and absolutely delicious. And this step takes about 15 minutes - so not gruelling by any stretch. Using prewashed baby carrots and baby potatoes = almost no prep. A chunky cut of an onion means they can be picked out easily (if you have one of "those" at your table). I like to add the flour, salt and pepper to the meat right in the tray the beef came in. One less bowl! Don't use a Non-stick pan - just use a regular one. You want the flour and flavour to stick to the bottom for the gravy. Another quick prep tip: use chopped garlic from a jar. Purists will say it doesn't taste as good, but the other 95% of the world wouldn't taste the difference. Brown the stewing beef on all sides. When brown remove the meat from the pan and mix into the slow cooker with the veggies. Don't worry about all that brown stuck to your pan - that's gravy goodness! Add your red wine, broth and flavouring mixture to the pan. Over low heat cook this mix and scrape at the bottom. When all the browning has pulled off the pan and into the gravy it's ready. Pour the sauce over the meat and veggies in the slow cooker. Stir. The sauce won't completely cover everything - and that's ok - it will cook everything with the lid closed via steam. In the last 15 minutes add the frozen peas. If you'd like a thicker gravy, remove the lid for a few of the last cooking minutes. 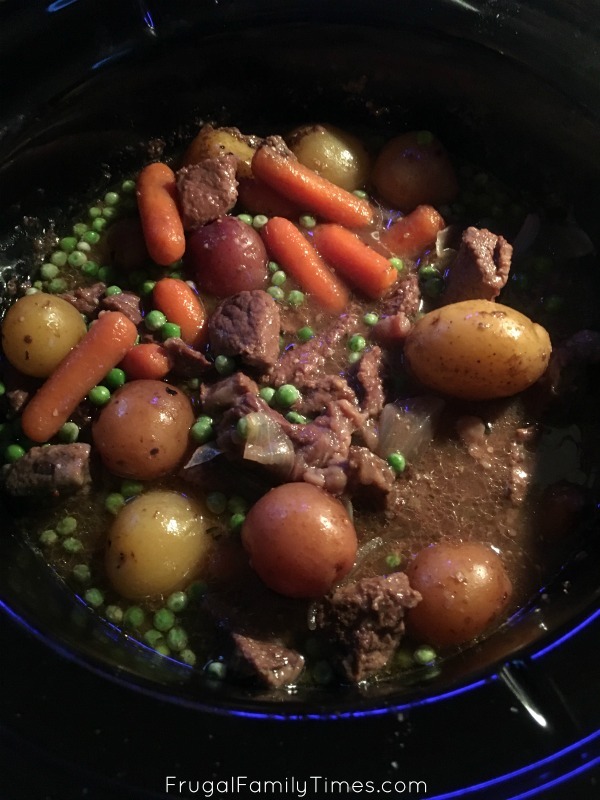 I decided to call this stew recipe "Rustic" but I could have easily called it "Kid-Friendly". This beef stew has big hearty chunks of meat and vegetables - so rustic, right? Those same big pieces are what makes it great for kids too. Cut the onion. Wash potatoes (if not prewashed). Place onion, carrots and potatoes into a large slow cooker. Season stew meat with salt and pepper. Add flour and toss. Set aside. In a large measuring cup add the red wine, broth, Dijon, Worcestershire, soy sauce, brown sugar, salt and thyme. Mix. In a heavy skillet, warm the olive oil over medium heat. Saute the garlic until it is soft and fragrant. Add the floured meat and all the extra flour. Without stirring, let the beef cook. Stir the beef and cook on most sides. Add the browned beef to the slow cooker and stir to combine with the veggies. 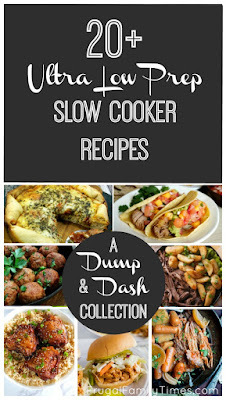 With the lid on, set the slow cooker on High and cook for 4 hours. In the last 15 minutes, stir in the frozen peas. Taste and add more salt if needed.